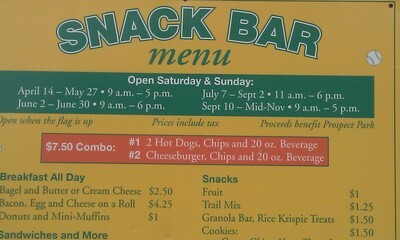 20-Ounce Sodas for sale at Prospect Park's Parade Grounds playing fields snack bar. Two vending machines in the lobby of the Brooklyn Public Library dispensing 20-ounce bottles of non-diet Snapple were the subject of a post here last month. The latest example of drinks larger than the mayor wants to allow being sold on city government property comes from the snack bar at the Parade Grounds playing fields in Brooklyn's Prospect Park, which is selling 20-ounce non-diet sodas, "proceeds benefit Prospect Park." The same point we made about the Brooklyn Public Library applies here: "Since Mayor Bloomberg is so determined to prevent privately owned New York businesses from selling sugary drinks in sizes larger than 16 ounces, you would think he might take action to prevent the actual New York City government agencies he controls from doing the same....All too often this is how government regulation works — the government tries to impose rules on the private sector, complete with penalties for failing to comply. But the government itself doesn't follow the rules it tries to make the private sector obey." I guess the mayor can say that the snack bar isn't run by the City Parks Department itself but by a concessionaire under contract with the Prospect Park Alliance, and that the contract with the concessionaire may have predated Mayor Bloomberg's administration and may not allow the city to dictate drink sizes. None of that makes the situation any less grating for those New Yorkers who are in favor of beverage freedom.